A family all of their own. It may come as a surprise to many people, but not all black birds are blackbirds. That sounds confusing but there is a rationale behind it. To begin with, one of the most noticeable species, Crows, do not belong to the blackbird family although they are indeed quite black. Crows are large birds closely related to jays in the avian hierarchy. Their close cousins, the Ravens are not true blackbirds either. Both of these species are found throughout the region, but Crows are abundant and may form large flocks, especially in late fall and winter. In parts of eastern Ontario, they number in the thousands, whereas there are tens of thousands in the southwest, particularly around Chatham where nighttime gatherings look for all the world like a scene from Hitchcock’s 1963 classic ‘The Birds’. That is not something that car dealerships look forward to as winter approaches. Ravens, on the other hand are decidedly uncommon and are usually hard to find in the south. The principle difference between the two is size. Ravens are noticeably larger if both are side by side, but if alone, look for a wedge-shaped rather than a rounded tail and heavy bill. The call is a giveaway. It is not the familiar caw of the Crow but a low raspy croak. This denizen of the north, a cliff nester, has fallen in love with farm silos in the south. There are few features in the countryside that offer a better view of the landscape, so Ravens have opted to raise their young from the top of the ladder on this rural penthouse. True blackbirds are in a family all their own and have no relationship to Crows or Ravens other than their basic colour. Most familiar among them is the Red-winged Blackbird. The splash of colour on the shoulder of the male is unmistakable. In spring it flashes its ‘epaulettes’ to competing males and with its showiness and call, it defends its territory for a prospective sparrow-like female. Most people associate them with marshes, but they are at home along wet roadsides, in swamps, weedy fields and even city parks. Their larger cousin, the Common Grackle, is the tough nut of the bunch. The male has a long keel-shaped tail and in bright sunlight shows a colourful iridescence with a purple head and bronze body. Its bright golden eyes present an intimidating expression matching its behaviour. 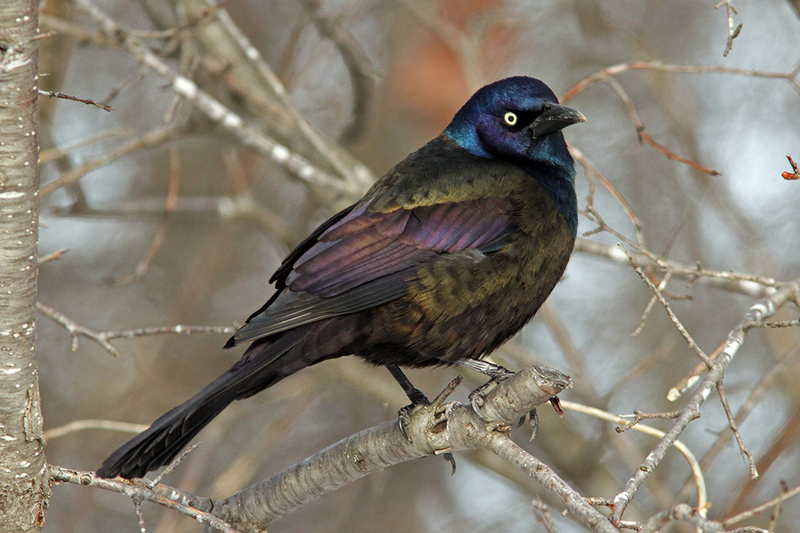 Grackles are well known as nest robbers, eating both eggs and young. They are also aggressive with other birds and will take over feeders until they have had their fill. They certainly give blackbirds a bad name. Another species in the mix is the Brown-headed Cowbird. The males are black with a brown head and neck. Females are a nondescript gray. A bit smaller than a Red-winged Blackbird, this species is a parasite. It does not build a nest or rear its young. The females lay eggs in the nests of songbirds, with individual females tending to specialize on a particular host species. It could be a Song Sparrow, Yellow Warbler, Cardinal or many others. She will look for another female that is actively laying, then deposit her own egg when the host bird leaves for a time. The Cowbird egg usually hatches early and because the chick is larger than the other chicks, it will be fed more frequently. It may also toss out eggs or young leaving the unknowing mother feeding a bird that, in the case of a warbler, may be twice its size. There is one more dark species, not entirely black, that is often considered a blackbird. 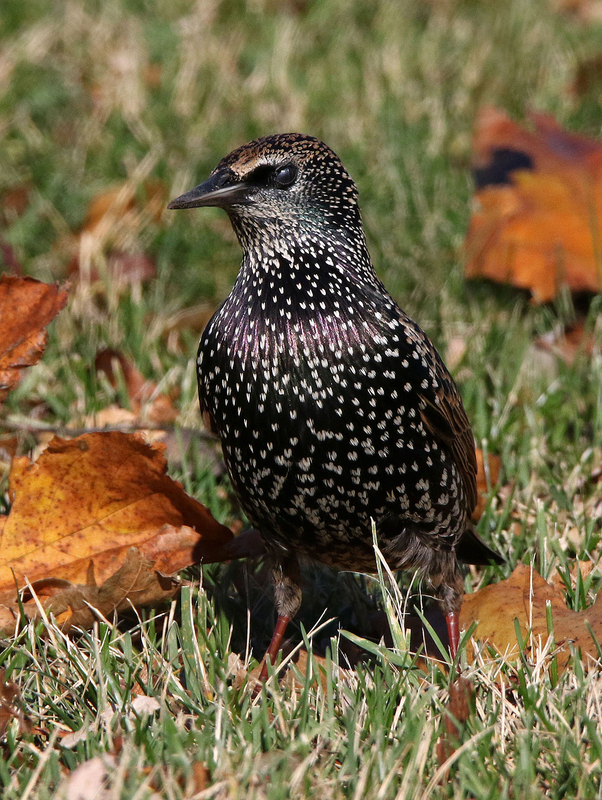 The European Starling outnumbers all of these other birds by a country mile. The chunky birds breed in both urban and rural settings in any available cavity and that includes a hole in the side of your house, an uncovered exhaust vent or any of a hundred places in aging industrial sites. The issue with them is that they have outcompeted native songbirds for nesting spaces, taking natural cavities that would have been used by swallows, bluebirds, woodpeckers and others. If you have Starlings visiting your feeders, they will devour suet like there is no tomorrow. I have had them clean out a suet cake in two days. The good thing is that most leave the country in winter, especially if it is a harsh one, heading south with all of the blackbirds into the central and southern United States. That gives us a welcome break in our yards because frankly, blackbirds can be hard on the pocketbook. While not the most appealing birds, Crows, blackbirds and Starlings put on an amazing show at dusk. Late in the season they gather in the thousands to roost for the night. Just be thankful they don’t select your yard as the Comfort Inn. Brian Morin is the publisher of Ontario Birding News, a newsletter for birding enthusiasts. He has been actively involved in watching and photographing birds in Ontario for more than 40 years.